A gunman opened fire at a South Florida high school today, killing 17 people and sending students running for their lives, according to two law enforcement officers on the scene. — At least 17 victims were taken to Broward Health Hospitals from the incident at Stoneman Douglas High School in Parkland, though their conditions were not immediately clear. Victims include students and adults, the Broward Sheriff’s Office said. — The suspect, 19-year-old Nikolas Cruz, was taken into custody off campus. He slipped out of the school after the shooting by blending in with other students who were trying to escape, according to two law enforcement sources and an eyewitness. — Cruz had “countless magazines” and was believed to have an AR-15 rifle, the sheriff said. — The sheriff said Cruz had attended the school but was expelled for disciplinary reasons. — Students were seen sprinting out of the school with their hands up as authorities with guns drawn swarmed the area. Other students were seen lined up one by one, leaving the area in an orderly fashion. Some students were hysterical, reported ABC affiliate WPLG. Medical personnel tend to a victim following a shooting at Marjory Stoneman Douglas High School in Parkland, Fla., on Feb. 14, 2018. Women embrace in a waiting area for parents of students after a shooting at Marjory Stoneman Douglas High School in Parkland, Fla., Feb. 14, 2018. People emerge from a building with their hands raised after reports of a shooting at Stoneman Douglas High School in Parkland, Fla., Feb. 14, 2018. 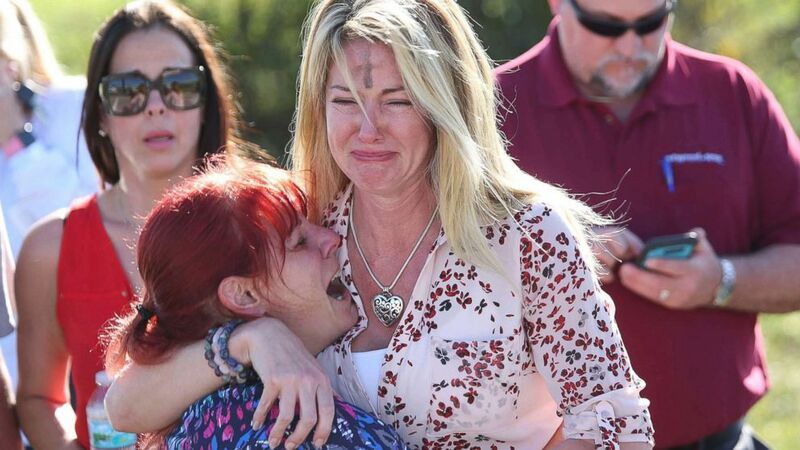 People are brought out of the Marjory Stoneman Douglas High School after a shooting at the school on Feb. 14, 2018 in Parkland, Fla.
Family members embrace following a shooting at Marjory Stoneman Douglas High School, Feb. 14, 2018, in Parkland, Fla.
Students released from a lockdown embrace following a shooting at Marjory Stoneman Douglas High School in Parkland, Fla., Feb. 14, 2018. Nikolas Cruz, the suspect in a shooting at Marjory Stoneman Douglas High School in Parkland, Fla., is escorted out of a hospital and into a police car. A map shows the location of Marjory Stoneman Douglas High School in Parkland, Fla. The school will be closed for the rest of the week, Broward County Public Schools announced Wednesday night. There are over 3,000 students at the school, according to its website. ABC News’ Pierre Thomas, Aaron Katersky, Rachel Katz, Matt Gutman, Josh Margolin, Jack Date and Ben Stein contributed to this report.